brider's place: Surly Cross Check -- the build, the ride. I've had some time to get some miles on the Surly Cross Check now, with the build having been completed just before Christmas. With over 250 miles on the new ride, I'm finding it very comfortable, solid, and mild-mannered. I went about building up this bike with an eye on budget, but not cheaping out on function or durability to get the lowest cost. The Surly Cross Check isn't a high-end bike by any means, so it didn't make sense to trick it out with light-weight or high-zoot parts. First, I checked my parts bin to see what I had already. 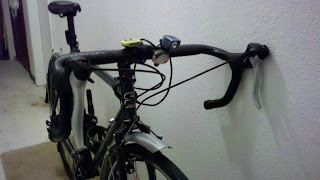 * Handlebars -- A no-name "wing" type ergo road bar. * Stem -- Easton EA50 100mm, +/- 6 degree. * Seatpost -- American Classic Aluminum. * Saddle -- old Concor from an old bike I don't have any more. 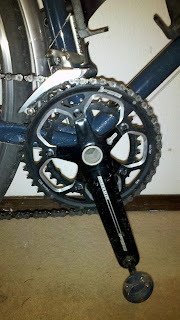 * Front Derailluer -- Had a choice of two: a Shimano 105 7-speed, and an Ultegra 8-speed. I used the 105. * Pedals -- One of my many sets of Speedplay pedals. * Chain -- SRAM 8-speed. I have several in stock for maintenance. * Cassette -- SRAM 830, 11-28 spread. * Bar Tape -- Benotto Bike Ribbon. * Brake/shift levers -- Shimano 2300, bought off eBay for $63. The windows over the gear indicator needles are broken off, but it doesn't affect the function. 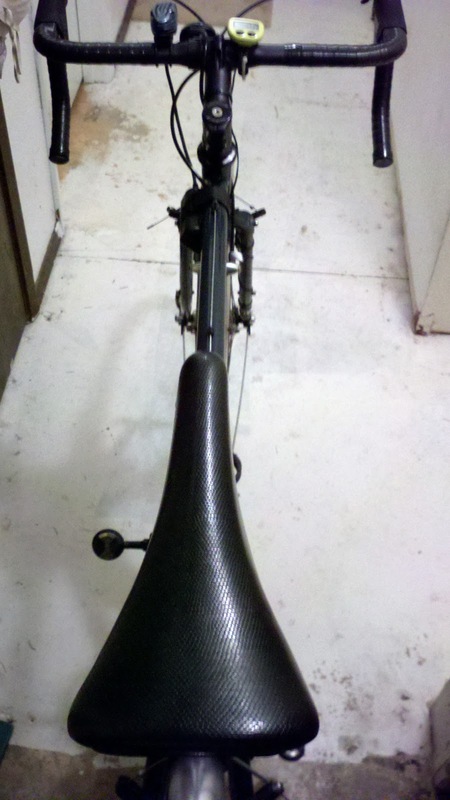 * Brakes -- Cane Creek Curve, another eBay purchase for $55. More on these later. 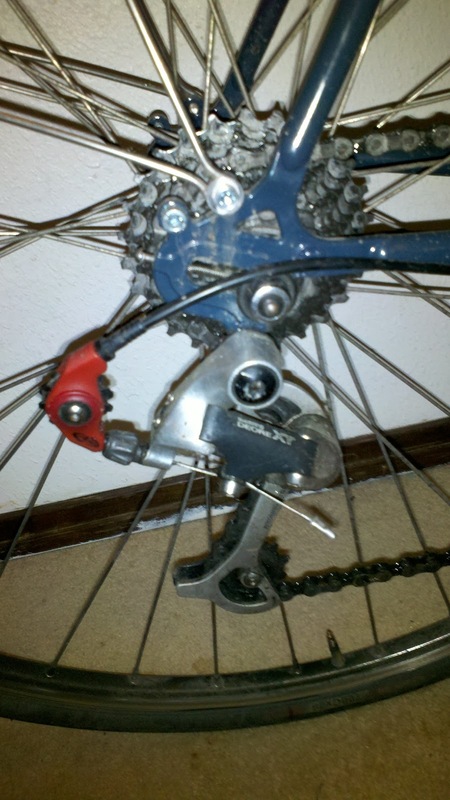 * Rear Derailleur -- Old Deore XT unit. 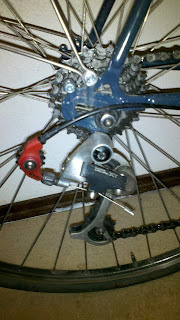 I had searched eBay for long-cage derailleurs that would work, then asked around on Slowtwitch and BeginnerTriathlete. Turns out a fellow forumite on BT had this RD that he would give me. Free stuff is good. * Cranks/Chainrings and bottom bracket -- FSA Gossamer with Mega-Exo bottom bracket, $45 from Slowtwitch classifieds. * Tires -- Kenda Kwest 700x35mm, $25 from wholesale. * Headset -- FSA Orbit XL-II, $30 from wholesale. * Fenders -- Planet Bike, from the shop where I work, $33. You'll note that I didn't include the wheels. I'll get to that in a bit, but for now I'll just say I transferred them from another bike. I've built up several bikes from bare frames, so it's not an unfamiliar task to me. Everything went together fairly smoothly. In fact, the most arduous task was cutting the fork steerer to the correct length -- the hack saw at the bike shop needs a new blade, especially now that it's been abused on this steel steerer. Dialing in the drivetrain used a little creativity with the chainrings. The crank is made for a narrower 10-speed chain, so the chainrings are closer together to prevent the chain from lodging between them. But that closer spacing makes for chain rub when using the small chainring and smaller cassette cogs. Not much of an issue, as about the only time I use the small chaingring is getting started out my driveway. But it's an annoyance that can be avoided -- I reversed the direction of the small chianring, putting the offset towards the inner side rather than the outer. Voila! Eight-speed shifting without chain rub. And why 8-speed, when current spec is now almost universally 10-speed, you may ask? Well, I've got a couple of good reasons for that. One, all my other bikes are 8-speed, with the exception of my mountain bike (which is currently one-speed). I like being able to swap wheels and cassettes between bikes. And I've got a lot of those (along with chains and other maintenance parts). I don't want to have to swap a cassette BECAUSE I swapped wheels. My system is grab-and-go, and I like it that way. Second, 8-speed is more robust, especially the chains. It lasts longer before it needs to be replaced, is less finicky with chainline adjustment, and is just plain stronger (due to the thicker chain side-plates). With this bike being a commuter and potential off-road ride, reliability is a key factor. I added one rare piece that I've found to improve shifting performance dramatically -- an Avid Rollamajig. I don't think Avid makes these any more, which is too bad. It's a piece that goes in-line with the rear derailleur cable, replacing the large loop of cable housing with a roller, eliminating a whole lot of cable friction. The brakes have their own saga... The Cane Creek Curve brakes are made for mountain bikes, a linear-pull system. Great for tire and fender clearance, no need for brake noodles (so a lot less cable drag)... but DISMAL brake performance with short-pull road levers. I thought I had the brakes set with the pads very close to the rim, and decent stopping power, but the first two rides convinced me that this was NOT the way to go -- levers buried to the handlebar, and still needing lots of road to stop the bike. I could have added a Problem Solvers Travel agent (a device that makes long-pull linear brakes compatible with short-pull road levers), but that kind of defeated the purpose of using the Cane Creek brakes. Fortunately my shop has a "vintage" bin of parts that I've been given free-reign to pilfer. For free. Yep, free parts are nice. I picked out a set (well, three actually) of cheapie cantilever calipers and put them on instead. This also necessitated a front cable hanger. I grabbed an old Tioga unit from the same parts bin, ground out some of the material so that it would clear the FSA headset upper bearing, and I was good to go. Well, that is after two of the cantilever spring tension rings detonated when trying to center the brakes side-to-side. Plastic is not the right material here, but the brakes were the right price, so I can't complain too much. Finally, with the brakes dialed and holding, I was good to go. 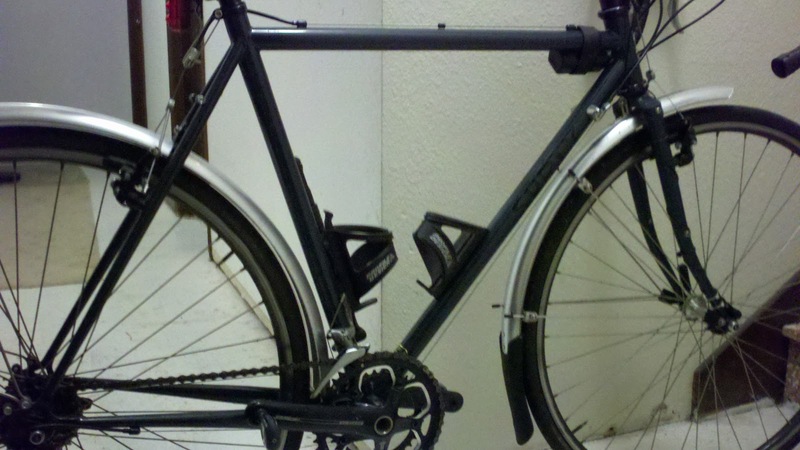 I took the wheels off my Paul Barkley Softride, which I'd been using as my commuter. The tires are 700x28mm Performance Stradas, a lower-end tire with some decent meat to them. They're getting a little long in the tooth (the tires), so I figured I'd be replacing them soon in any case. The wheels themselves are Mavic Open 4CD rims, 36-spokes, laced to a Shimano 105 rear hub and Suntour Sprint front hub. Yep, these wheels are probably 18 years old, or more. The Mavic rims were THE workhorse rim of the day -- strong, decently light, and incredibly durable. I haven't had to do much to them at all, even in the way of needing truing. Strong stuff, those rims. But the 28mm tires are at about the limit for these narrow road rims -- going with wider tires pinches the tire casing down, causing vague cornering feel and increasing the chances of pinch flats (sport-bike motorcyclists know what I'm talking about, for sure). So I'm still running the 28mm tires on these wheels. My plan is to get a set of Velocity Chukker rims to lace up to my even older (and with more miles on them) Ultegra/Sprint hubs, and then utilize the Kwest 35mm tires. And maybe slap on some even WIDER off-road worthy tires for some gravel road riding (hmm... plans in the works, maybe?). So, yeah, enough about the parts, HOW DOES THE BIKE RIDE? It's not light, by any means, but with the purpose of this bike in mind, it doesn't need to be. I'm not planning on doing any cyclocross races on it (hoisting it onto my shoulder 5 times a lap to hurdle the barriers), so the weight isn't much of an issue. The handling is very stable. No-handed riding is effortless, even down to 10 mph. This is one of the things I was looking for in the bike -- almost fall-asleep steering. Not something I'd want to race in the local crit, but that's not the bike's purpose. It jumps well out of the saddle, accelerating well, but bumps in the road generate a light "thump" rather than a bone-jarring "clang". While nothing can be as plush as the Softride, this bike doesn't beat me up like others I've ridden (hello, aluminum Cannondale!). Part of that is due to just the characteristics of steel, and part is the design of the frame. I've been riding this mostly on my daily (or at least almost daily -- I've about 50% for the year so far) commute to work, as well as Saturday morning group rides out of Inspired Ride Bicycles, with a few other rides thrown in for good measure. I haven't yet taken the bike off-pavement. I'm waiting for the re-build on the wheels (and using the wider tires) for that test. By every indication so far, the bike should behave admirably. looks great! I'm still holding out on adding a cross bike to the stable...but this has me tempted. I highly recommend it! Some kind of "fatter tire" road bike is just so much fun. I haven't taken it truly off-road yet, but with some beefier tires, gravel roads are in my near future. Love what you wrote about your Surly Cross Check. I recently got one as well and really loving the way the bike rides. Were you planning on taking the Surly on the Gran Fondo Leavenworth? I signed up for the Gran Fondo (still trying to explain that to my friends) and was planning to take my Surly. Hey Tony! I actually ended up selling the Cross Check to a young lady in Portland. 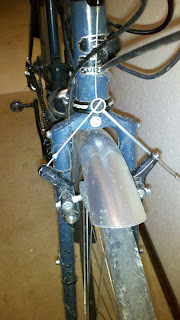 While I liked the ride, I was never in love with the cantilever brakes. After building my own design with Dave Levy in a 3-day class at Ti Cycles Fabrication, I decided to sell the CC. I rode that bike at Leavenworth. Thanks David! That's pretty funny. I actually bought the Surly because of the cantilever brakes. Too many bad experiences with Avid BB5 disc brakes. Cheers!